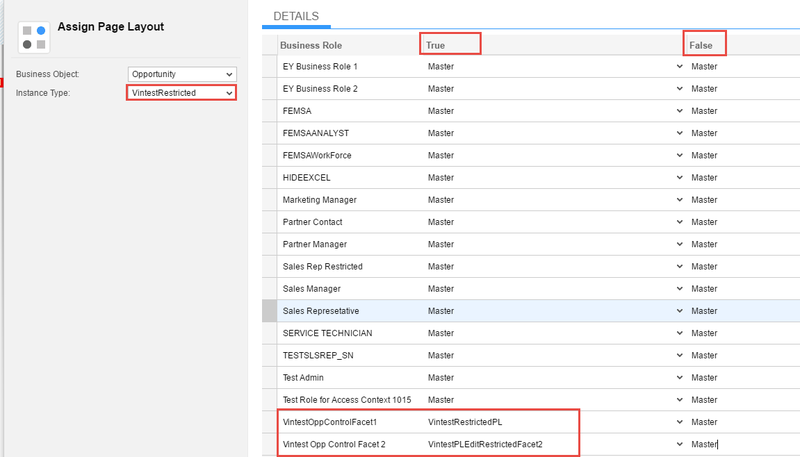 Question: If I have conflicting privileges for multiple roles assigned to the same business user, how does the system determine what privileges to assign? Roles and Access: If a user is assigned two business roles; one granting display only access and another granting edit access then edit access takes preference and user will get edit access to the transaction. Taking an example, if there are 2 user groups that have edit rights to the objects, BUT should be allowed to edit only a subset of fields or their combinations, then, you can have 2 roles –both allowing Edit Access, but 2 different Page Layouts with defined combinations of read only fields. Which PL should get assigned to which Role can also be controlled by another (list) field which is the Instance Type for a BO. Field Condition Layout Role ReadOnly ? Visible ? Page layouts can be assigned to roles based on an Instance Type – eg: Restricted field in the above examples. If the Read Only or Mandatory property is enforced by any of the assigned Page Layouts of the applicable roles, it prevails.